Kinesiology taping is not a new method. It's been around a while and is predominantly seen used by athletes, including Team GB during London 2012. The tape was developed in Japan by Dr Kenzo Kase in the 1970s to provide therapeutic support without restricting range of movement. Following a period of testing and further refinement the Kinesiology Taping method was released to the world. The tape can be applied to support joints, promote correct locomotion and joint articulation, stimulate muscle engagement, support weakened joints, reduce scarring, reduce pain, and increase the movement of circulatory and lymph fluids. 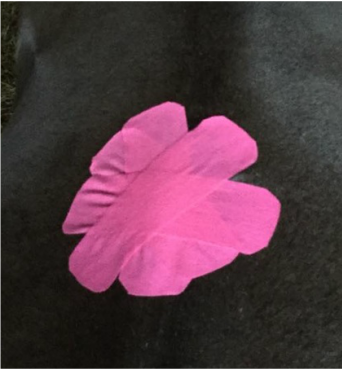 Kinesiology taping really works well both as a complement to the Equine Touch but also as a stand alone method for assisting with performance or recovery from injury. For the application to take, and for optimum longevity, the coat will need to be clean and dry. Feathers may need to be trimmed. ​Jo will carry out a kinesio test to understand the optimal colour of tape for the application as some horses respond better to some colours than others. How much does taping cost? Taping only: £25 to include up to 60cm of tape. £5 per 50cm of tape thereafter. Taping as part of an Equine Touch session: £15 to include up to 60cm of tape. £5 per 50cm of tape thereafter.